Many people think that if they live in an apartment, they can’t compost. After all, there’s the space issue to contend with. Plus, without a yard of your own, what would you do with all that valuable compost? I’ve gone from house living to apartment living in the past few months, and I’m still happily composting away. Composting is an awesome way to help the environment. And even if you live in a small space, you can still easily get into composting. According to the EPA, the US generates 34 million tons of food waste each year. Less than 3% is recovered or recycled, which means we have over 33 million tons of food going into our landfills each year. That’s 14% of our municipal waste stream. First, all this food is taking up valuable space when it could easily be recycled. Second, and more devastating, is the gases this food puts out as it decomposes. As food breaks down it releases methane, a greenhouse gas that’s 21 times more potent than carbon dioxide. Thanks in large part to all the food waste, landfills produce 20% of the world’s methane emissions. This is a huge contributor to global warming. All this means is that anything we can do to keep food out of our landfills is going to help the environment. Worms break down food without producing any greenhouse gas. So, it’s a good thing! I started my own vermicompost bin exactly a year ago, and I’m happy to say the Snickersons are thriving tremendously. I haven’t done a formal count, but I think I have at least 10,000-20,000 worms in my bin at this point. Probably more. Vermicomposting indoors is easy in an apartment. I bought a Can-O-Worms system off Amazon, but you can easily make your own vermicompost bin. The bin I’m using sits in a corner of my living room. Yeah, seriously. It looks more like a strange side table than a worm bin. I use it to set my plants on. When I need to put food in the bin, I take off the plants and open up the lid. Worm bins don’t have to be huge affairs. You can make one out of a small plastic bin and store it in a cabinet, a closet or under your kitchen table. If you’re living in an apartment then your next question is probably about the compost your worms will quickly start to produce. What the heck do you do with it if you don’t have a yard? Well, if you have houseplants you can use the worm tea to water your plants. The “worm tea” your wormies produce is full of awesome nutrients that your plants will love. As far as the compost itself, you have several options. First, you can add it to the houseplants you already have. Compost can radically transform how well your plants grow! If you don’t have a green thumb, then think about donating your compost to a local farmer (go to Local Harvest to see a list of farmers in your area…most of them would be thrilled to get compost from you!). You can also donate your compost to your local community garden. I just found out about the Bokashi composting method a few days ago, and I’m super excited about it. The only downside to vermicomposting is that you can’t put meat, bones, fat, cheese or any other animal-derived by-product in your bin. These items have to go in the trash. The cool thing about Bokashi is that it composts animal ingredients in days. The All Food Recycling Compost Kit with Bokashi , as pictured on the right, is small and would easily fit on the floor or under your sink. Bakashi is, specifically, an EM microorganism that you sprinkle over your food waste to break it down. Bokashi, as you might imagine from the name, originated in Japan and, from what I read, entire towns are using it successfully to manage their household waste and grow incredible gardens. The biggest benefit to composting with Bokashi is that it doesn’t smell. You can put meat and bones into the bin and, once you sprinkle on the Bokashi, the smell is gone. And if you don’t already have a vermicompost bin in place you can use your Bokashi system for all your food scraps. Since we don’t eat meat there’s no reason for us to also use the Bokashi system…our wormies happily decompose everything we give them. 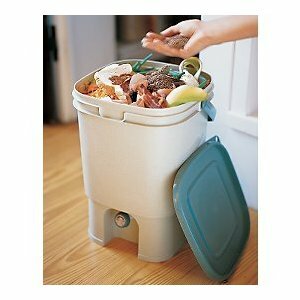 But if you do regular eat meat, dairy and fish then the Bokashi system is a great way to start composting indoors. If composting seems like too much work, then you can still help simply by keeping all your vegetable scraps in a compost pail. 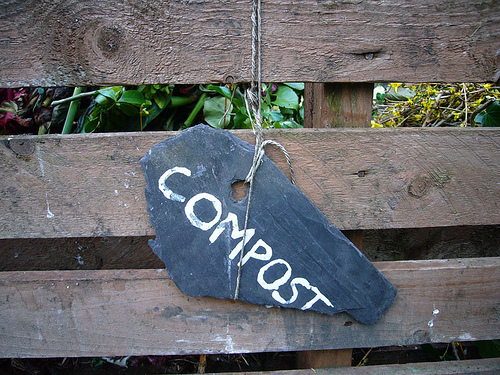 Instead of composting it yourself, you can donate your scraps to a local composting facility, who will do it for you. Go to FindAComposter.com to see what’s available in your area. These farms often sell their compost to gardeners and local farmers, so you’re helping them out in a big way, as well as helping the environment, by keeping your scraps out of the landfill. I love composting, and am really happy I got into almost a year ago today. Exciting! No matter where I live or what I end up doing, composting is likely to be a part of my life forever. Do you compost indoors? Do any of you use the Bokashi system? Please write in and let me know how you’re doing! I vermicompost in my apartment. The worm bin is under the sink for quick and easy access as I cook. Plus my houseplants love the castings it produces! Ok, I’m really tempted to try the bokashi mix on our composting toilet… but otherwise, I really need to get verming!